Summer stories for a cold day! Remember summer? That brief, happy time when the sun shines, we flock outside and forests burn? To help you remember, in the dark cool of winter, let me tell you a story about fire, fear and resilience – and a bunch of really cool kids. Not so very long ago, a large fire roared through the Columbia Gorge. As ash rained in Portland, people mourned that their favorite places had seemingly gone up in smoke. People were frightened. In the Gorge community of Cascade Locks, many residents evacuated their homes, not knowing if there would be anything for them to return to. 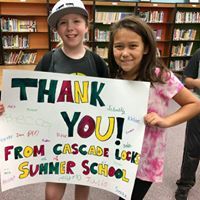 Last summer, I visited children in the Cascade Locks Elementary School summer program to talk with them about their experience with the Eagle Creek fire. Almost every child shared their story about what happened and how they felt when they had to leave their homes. My colleague Ralph Bloemers from Crag Law Center took care to gently teach the kids about how the fire affected their backyard forest ecosystem. Then – even better than talking – we took them into the burned forest. What happened next was the highlight of my summer, and I invite you to share it by watching this excellent three-minute video! The kids of Cascade Locks will be telling their stories about the Eagle Creek Fire their whole lives. Because of this day in the forest together, their stories are transforming from fear and devastation to excitement about a forest renewed. When summertime rolls around again, and the fires burn again, remember this story. Like the kids of Cascade Locks, we invite you to take a walk in the charcoal forest and see the wonder of creation fire can leave in its wake. P.S. Did you notice the wonderful 14-year old Bark volunteer, Ember, in the video? Your donation to Bark supports volunteers of all ages learn (and teach!) about the forest.